Faith can be an important part of a survivor’s journey of healing, but in some cases it can also complicate their path to safety. Some survivors may be faced with abusers who manipulate religious beliefs and religious teachings or faith leaders who lack the knowledge to provide counsel, creating additional barriers to escaping the abuse. Domestic violence can affect anyone, regardless of how they identify, the communities they belong to, or how they are seen by others. Domestic violence can affect anyone, regardless of how they identify, the communities they belong to, or how they are seen by others. 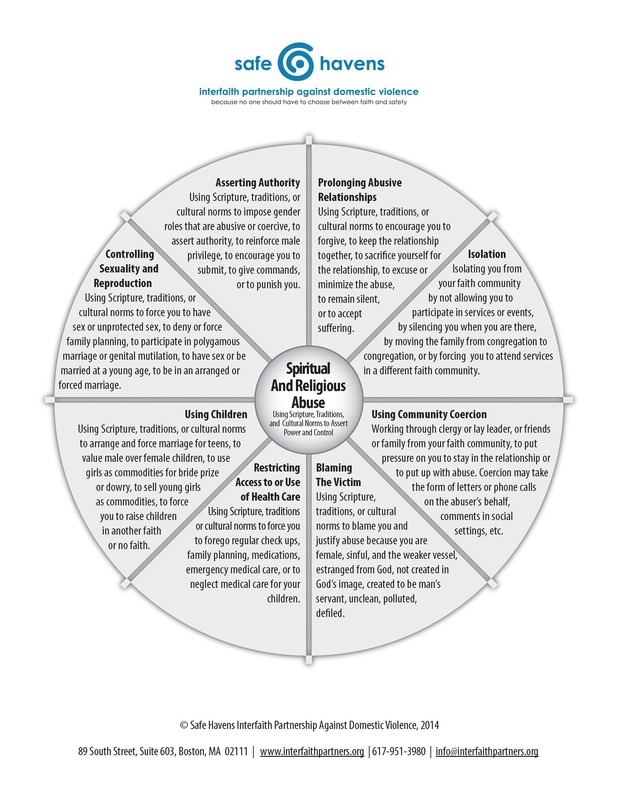 Religious affiliation is no exception to this—domestic violence can affect people who practice any religion, no religion, multiple religions, or who engage in other spiritual practices. Abusers may employ religious texts and values to harm the survivor. This can be done by selectively quoting religious texts or interpreting religious values as a means to assert male entitlement and privilege or otherwise provide justification for the abuse. Often, this dynamic manifests as an abuser telling the survivor that they are not living up to the ideals of what a partner should look like according to their religion . Abusers belonging to faiths that emphasize marriage may manipulate the esteem for a religious union to pressure the victim into staying in the relationship in order to preserve the respect of the religious community. An abuser may also use teachings about dating, sexual relationships, gender roles, or reproductive choices to pressure an individual into not seeking help. If the abuser is a religious leader or has a position of respect within the faith community, the survivor may feel additional pressure to remain silent. Despite these complexities, faith and religion can also be vital components of a healing journey. One study indicated that, for a majority of survivors of domestic violence, spirituality or belief in God was “a source of strength or comfort” . Another study showed that nearly half of survivors sought religious or spiritual counseling after experiencing abuse . Many survivors find strength to leave and heal from abuse through their religious practices and engagement in their religious communities . In addition, research indicates that religious involvement promotes greater psychological well-being and can also increase a survivor’s sense of social support . It is crucial that faith leaders take steps to better understand the dynamics of domestic violence and how to support survivors. It is also necessary for advocates and service providers to understand how to support survivors’ religious practices . It is crucial that faith leaders take steps to better understand the dynamics of domestic violence and how to support survivors. It is also necessary for advocates and service providers to understand how to support survivors’ religious practices. Faith leaders are often trusted individuals in society, and many survivors turn to a faith leader or other religious figure when facing hardship, including domestic violence . However, not all religious figures respond appropriately to disclosure of experiencing domestic violence . Some survivors may be able to find assistance from faith leaders or counselors who have received training and can provide referrals to domestic violence experts. Survivors may find support through faith-based charities or support groups, which can be a helpful resource for survivors who want to speak openly about abuse with people from their religious community. Faith-based services can be an especially important resource for survivors who have dietary restrictions rooted in their faith traditions. Religious communities have the power to ensure that faith is not manipulated by abusers, but rather is a source of empowerment and community for survivors of domestic violence. Faith leaders and others in religious communities can show their support for survivors by fostering healthy and safe environments . Alpert, Elaine J., Al Miles, and Wickii Coffey. 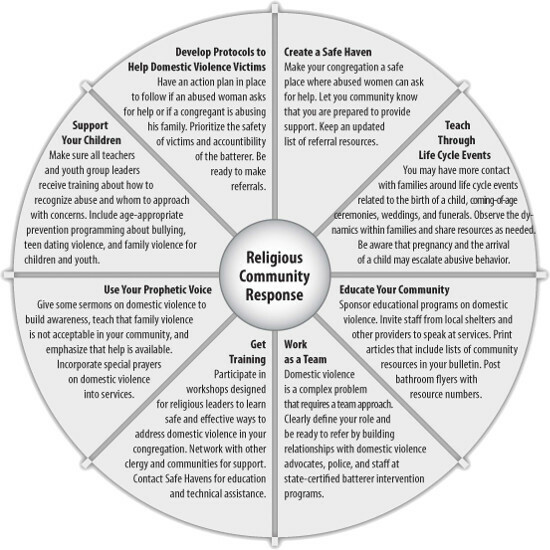 “Responding to Domestic Violence: An Interfaith Guide to Prevention and Intervention.” Family Ministries. 2005. https://www.familyministries.org/files/1.1.1. 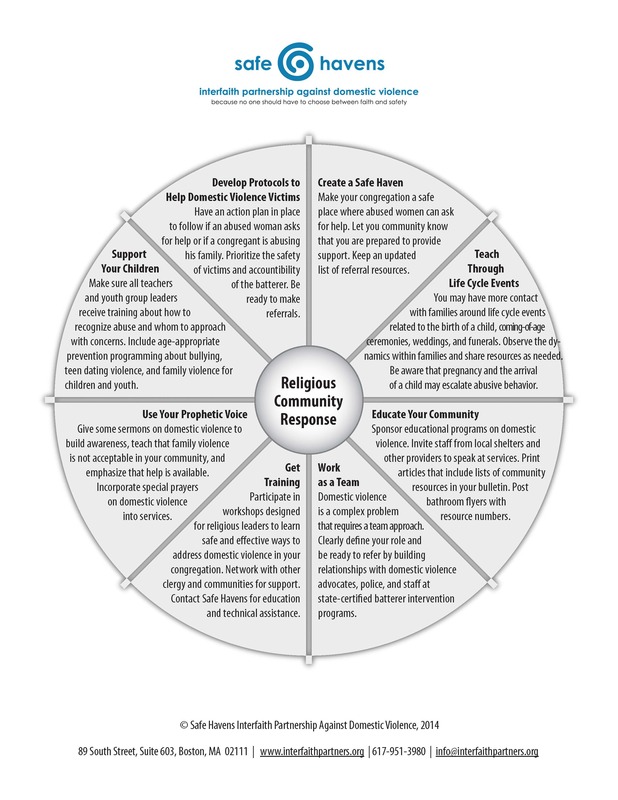 Responding to Domestic Violence An Interfaith Guide.pdf. 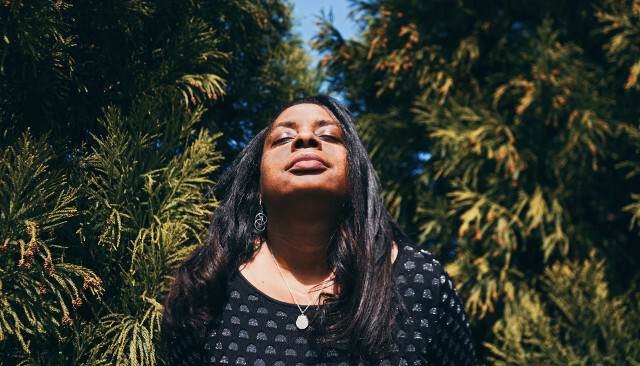 “How Can Faith or Spirituality Be a Resource for Domestic Violence Survivors?” National Resource Center on Domestic Violence. 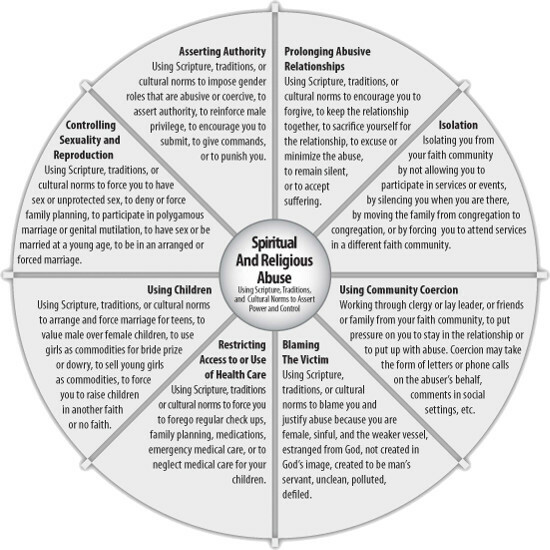 https://nrcdv.org/dvam/sites/default/files2/Religion&DV-TalkingPointsForm.pdf. Fortune, Marie M., Salma Abugideiri, and Mark Dratch. “A Commentary on Religion and Domestic Violence.” FaithTrust Institute. 2010. http://www.faithtrustinstitute.org/resources/articles/Commentary.pdf/?searchterm=sacred texts. “Domestic Violence and Religion.” VAWnet. June 01, 2013. https://vawnet.org/sc/domestic-violence-and-religion. “Broken Silence: A Call for Churches to Speak Out.” IMA World Health, We Will Speak Out U.S., Sojourners.